Transform the exterior of your property today with our high-calibre roofline products. Maintenance free uPVC guttering, soffits, fascias and cladding. Select Products offer a wide range of roofline products including uPVC fascias, soffits, guttering and cladding. Our roofline selection offers premium quality protection, function and aesthetic whilst using high quality and maintenance free uPVC. Our exceptional selection of fascias, soffits, guttering and cladding is available throughout, Leeds, Harrogate, Ilkley, Yeadon, Bradford, Horsforth, Otley, Wetherby and Pudsey. Using our extensive experience, we’ll transform your roofline so that it communicates a better aesthetic and delivers much-improved levels of performance. The benefits of replacing your guttering, soffits, fascias and cladding are manifold. Your new guttering and fascias will stop stagnant water from building up, while the soffits will ventilate your roof space and stop condensation from building up. Cladding will further prevent unwanted penetration from weather elements and retain heat. Made with high-calibre uPVC, our range of guttering for roofline is completely maintenance free. This avoids the need for any costly gutter cleaning services. Excelling in versatility, our guttering is available in a range of designs. Featuring the half-pipe appearance, the popular ‘round’ gutter design is ideal for houses and small offices. Larger in size, the ‘square’ gutter design specialises in conservatories and rooflines with high-flow rates. Catering for high-capacity needs, the ‘ogee’ design features a widened gutter with reinforced corners to ensure the efficient handling of a rapid run-off rate. The ‘deep’ gutter contains a higher capacity for increased flow. All our guttering ensures a consistent standard of free-flow, preventing build-up and water stagnation. As standard, our uPVC guttering is predominately manufactured from top-grade recycled materials. Available in a range of beautiful colours and finishes, our guttering can be tailored to match the aesthetic of your property. When installed in conjunction with new guttering and fascias, our expert soffit installation ensures neat finishing, and improved aesthetics on your roofline. Covering the framework of the fascia mount, soffits prevent your home from looking unfinished. As well as aesthetic benefits, our soffits excel in function. Intelligently designed for ventilation, premium quality soffits from Select Products will prevent condensation build-up. Without adequate ventilation, condensation will form in the roof void and increase the risk of timber decay, which will be expensive and time consuming to replace at a later stage. Made with 84% premier grade recycled materials, our guttering, fascias and soffits are environmentally friendly. Our soffits can accommodate for any property and fascia, due to the fact they come in a versatile range of colours and finishes – so you’ll be able to find a product that meets your needs. A top-quality fascia board is essential for effective rafter protection. Our superior fascia boards and roofline services shield your rafters from the elements, elongating their lifespan and preventing them from rotting or warping. Installed in tandem with uPVC guttering and soffits, our fascias will protect your roofline. Mounted where the roof meets the outer wall, our fascias will effectively support the lower roof tiles, while simultaneously carrying the guttering. Fascia installation can be adapted to contemporary or traditional properties, as they are extremely versatile and, therefore, a perfect choice for any home in Leeds. A heavy downpour could cause your roof to be running several gallons of water per second into your gutters. Our premium uPVC fascias will maintain guttering integrity, even in the most intense weather conditions. Environmentally friendly, our Fascia boards are made with 84% first-rate recycled material. Cladding is essential if you want to protect your roofline from weather damage. Our cladding is of the highest standard, and will effectively control wind infiltration. This stops unwanted draughts entering your property, as well as preventing heat from escaping. Your roofline will be perfectly preserved and your home well-insulated, thanks to our high-performing cladding. Without cladding, rain water will build up, which will damage your Leeds property. Select Products’ cladding and guttering controls water run-off, and prevents this from happening. 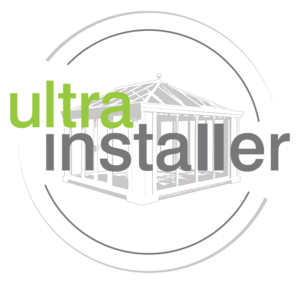 Maintenance free and environmentally friendly, our uPVC cladding draws mainly on high-quality recycled materials for its construction and will protect your roofline long into the future. Flexible in design, our cladding comes in a range of designs which include: ‘Shiplap’, ‘Open V’, ‘Teegee’, ‘Feather Edge’ and ‘M-Boss Cladding’. As standard, our cladding comes in a wide range of colours and can be effortlessly adapted to your property. Transform and protect your roofline with cladding, guttering, fascias and soffits installed by Select Products. The enduring quality of our fascias, soffits and guttering are matched in equal measure by our commitment to our Leeds customers. 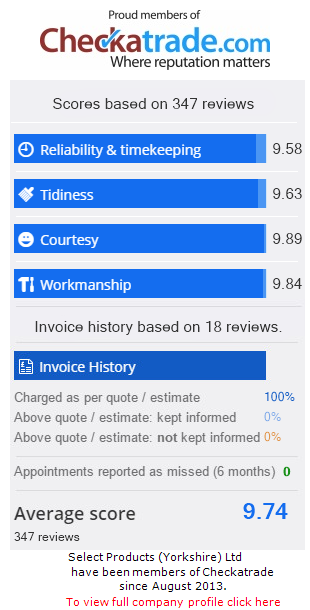 Every product we install is covered by a comprehensive insurance backed guarantee and, if you are renovating more than just your roofline, you can take comfort from the fact we’re registered with FENSA – a competent person scheme that continually assesses the ability of its members to ensure their work meets a high standard. Contact our experienced team today for more information about our guttering, fascias, soffits and cladding. We will be able to answer your technical questions and provide you with a free guideline quote to consider. Get in touch by calling us on 0113 257 8933 or come and see us in person at our showroom at 57 Rodley Lane in Leeds. A member of our experienced team will be able to show you the products you’re interested in and provide you with some guideline quotes. If you would prefer fascias, soffits and guttering prices only at this stage, you can visit our free online design tool. Enter some information about the product you’re interested in to receive guideline prices within just a couple of minutes. You can return to the app as many times as you like to generate quotes on different products – including windows, doors and conservatories. You’ll be able to find exactly what you need, and at a price to suit your budget, when you choose Select Products.